Would you like to learn more about integrating NetApp storage with Microsoft software? Santhosh Rao and other NetApp authors post regularly about subjects related to Microsoft integration, performance, reference architectures, and more on our NetApp for Microsoft Environments blog. This article is the ninth installment of Back to Basics, a series of articles that discusses the fundamentals of popular NetApp® technologies. To address this shortcoming, NetApp created its SnapManager® software, a suite of intelligent tools that allow applications and storage to coordinate activities to make backup fast and space efficient, speed the restore process, and simplify common data management tasks. The SnapManager suite represents thousands of man-hours of effort going back to the original SnapManager for Exchange product, which was introduced in 2000. Support both Data ONTAP® technology operating in 7-Mode and clustered Data ONTAP. SnapManager software runs on the server (or in a virtual machine) and interfaces directly with the application. Each SnapManager tool has its own user interface that lets you create and execute backup and replication schedules and perform restores. Depending on the version, SnapManager may also help you perform other application-dependent tasks. For instance, SnapManager for Exchange offers single mailbox recovery and SnapManager for Oracle offers partial file SnapRestore. A command line interface (CLI) makes it possible to write scripts to integrate SnapManager actions such as Snapshot copies as part of the normal operation of an application. In order to accomplish its work, SnapManager also must interface with the operating system running on the server (or in the VM) and with NetApp storage. To do this, SnapManager uses NetApp SnapDrive®. SnapDrive provides a set of core capabilities that all SnapManager products need. In the distant past, it was actually a part of SnapManager for Exchange (the first SnapManager product), but NetApp realized that by separating SnapDrive it could leverage its capabilities to create additional SnapManager products. The current generation of SnapDrive products includes SnapDrive for Windows® and SnapDrive for UNIX® (with support for Solaris, HP-UX, AIX, Red Hat, SUSE, and Oracle Enterprise Linux®). Both solutions support iSCSI and Fibre Channel transports. SnapDrive for UNIX also works over NFS. Figure 1) Relationship between SnapManager and SnapDrive. The crucial function of SnapManager operations is the creation of an application-consistent Snapshot copy on NetApp storage. This requires the following general steps. Create a list of LUNs to be included in the Snapshot copy. A Snapshot copy may include several volumes and can span several storage systems. Stop activity on all affected volumes or put the application in "hot backup" mode. Flush data from the host operating system for all volumes in the Snapshot copy. Create the necessary Snapshot copy or copies on the storage system(s). Once a Snapshot copy is created, it can serve as the backup by itself and provide the basis for other data protection activities that don't require further coordination with the application. For example, consider a typical data protection process with SnapManager for SQL Server (SMSQL). SMSQL carries out the necessary steps on the application side while SnapDrive for Windows performs the steps appropriate for a Windows environment. SnapManager invokes a Microsoft Volume Shadow Copy Service (VSS) Snapshot copy call for the application. VSS allows applications to continue to write to volumes during backup. VSS has three components: VSS requestor, VSS writer, and VSS hardware provider. The Microsoft application acts as the VSS writer and prepares the application for a VSS Snapshot copy. SnapManager acts as the VSS requestor and calls SnapDrive to create a Snapshot copy. SnapDrive acts as the VSS hardware provider and invokes a NetApp Snapshot copy on primary storage. SnapManager notifies SnapDrive for a SnapMirror update. SnapDrive invokes a SnapMirror replication to the DR site. SnapManager performs verification of the Snapshot copy. For non-Windows environments, consider a similar process for Oracle running on UNIX or Linux. SnapManager for Oracle provides the option for either full or partial backups. Full backups use fewer Snapshot copies to get the job done, but may keep tablespaces in hot backup mode for a longer period. A partial backup does essentially the same thing, but iterates through the tablespaces one at a time to minimize the time needed for backup. Again, despite the seemingly complicated process, the whole thing happens quickly and you don't need to know anything about how data is organized on the storage system or how it is sent over the network. SnapManager and SnapDrive work together to enable the application administrator to get the job done without having to constantly involve the storage administrator. Restore processes used by SnapManager vary depending on the application. Database-oriented applications typically use NetApp SnapRestore for full database restore. This allows a database to be reverted in seconds to a saved Snapshot copy, then log files are replayed to bring the database up to date so that it can be restarted. This process can often be accomplished in minutes versus the hours it can take to restore using other means. Most of the SnapManager tools supply a variety of restore options to meet differing needs. The unique capabilities of each tool are described here briefly. SnapManager software leverages a number of unique capabilities when running in Microsoft environments. Volume Shadow Copy Service (VSS) is used to provide application-consistent backups, as described above. Windows PowerShell™ cmdlets are provided by many of the SnapManager tools. These cmdlets provide a simple and powerful way to extend the capabilities of SnapManager tools and to incorporate key functions as part of management scripts. 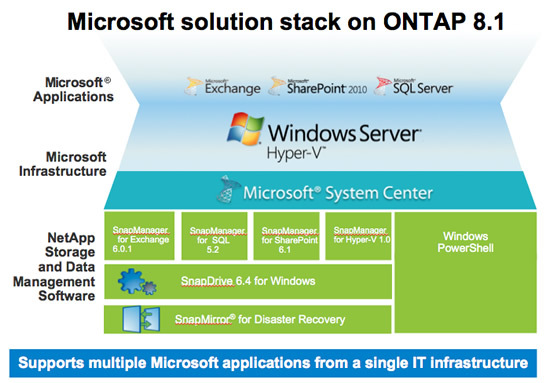 Figure 2) SnapManager solution stack for Microsoft products. Because of its integration efforts with these and other products, NetApp was named Microsoft's 2012 Private Cloud Partner of the Year. This section looks at use cases and unique capabilities provided by each version of SnapManager. All SnapManager software provides full automation to enable hands-off backup, restore, and replication for disaster recovery. Only the unique features of these use cases are discussed. Capabilities unique to a particular SnapManager product such as cloning or coordination with SnapVault® technology are also included. Single Mailbox Recovery (optional). With the optional Single Mailbox Recovery (SMBR) you can restore single mailboxes without maintaining a separate recovery server. Individual Exchange items can be restored to a production server. Flexible restore. SME provides a wide range of restore options. You can perform full Exchange Server content recovery, including Exchange Server 2010 database availability groups (DAGs), individual Exchange 2003/2007 storage groups, individual Exchange databases, and LUNs. Backup verification. SME has built-in capabilities for nondisruptive, automated, and concurrent backup verifications. Verifications can be off-loaded to nonproduction hosts. Reduced DAG reseeding time. Reseeding is necessary when a restore is done on an active database copy or when the replication to one or more passive copies breaks. The reseeding process is extremely bandwidth intensive. SME reduces bandwidth requirements and makes DAG reseeding go many times faster. Create federated backups. Numerous SQL Server instances and databases can be added to the same federated group so that all databases in the group can be backed up at the same time using NetApp Snapshot technology. Data protection for SQL Server 2012 Always-On Availability Groups (AGs). With SMSQL you can accelerate AG setup, rapidly back up and restore all databases in AGs, create space-efficient clones of databases in AGs, and quickly resynchronize databases within an AG. In addition, AGs can be mirrored to remote locations. Clone lifecycle management for dev/test. The ability to provide numerous copies of production datasets is critical in application development and test environments. Because of the space that copies consume, they are almost always at a premium. SMSQL uses NetApp FlexClone technology to create clones of datasets that only consume additional disk space as changes occur. Policy-based clone deletion and refresh simplify the clone management process. PowerShell 2.0 cmdlets let you integrate cloning into test scripts. Data lifecycle management. You can place archived SQL Server 2012 data in table partitions that are backed by secondary data files. These can be easily moved to secondary storage through the SMSQL database migration wizard. Automated discovery. Set up, monitor, and manage the growth of SharePoint Server farms across your enterprise. Protect critical FAST search server data. With SnapManager for SharePoint, FAST content SSA, FAST search server farms, and FAST certificates can be automatically backed up and restored. Archive data. SharePoint data can be archived to NetApp SnapLock® devices for compliance. Store large data files outside content databases. Using File Share Connector and Storage Manager you can move and store large unstructured data files to external BLOB (binary large object) storage or remote BLOB storage, either in real time or based on a defined schedule. End-to-end SharePoint storage, management, monitoring, and governance. Integrating SnapManager for SharePoint and AvePoint DocAve software simplifies SharePoint deployment, monitoring, and enforcement of governance policies. Manage your development, test, and production farms and control solution deployment via application lifecycle management. Advanced Oracle support. SMO provides full support for environments using advanced Oracle technologies, including Direct NFS, Oracle Recovery Manager, Real Application Clusters, Data Guard, and Automatic Storage Management. Full SnapVault integration. 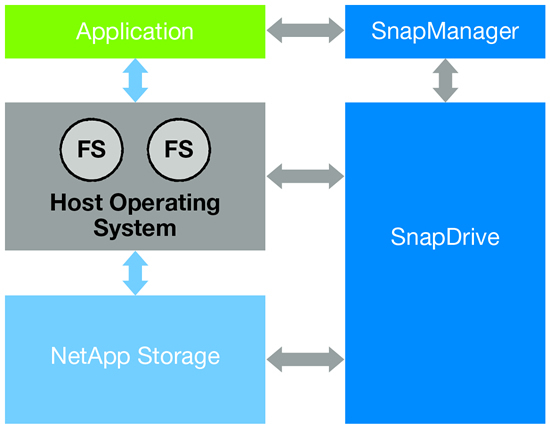 All SnapManager products integrate with NetApp Snapshot copies and SnapMirror replication. SMO also provides full integration with NetApp SnapVault, providing fast, space-efficient disk-to-disk backup to a local or remote location. Cloning for dev/test. The ability to provide numerous copies of production datasets is critical in application development and test environments. Because of the space that copies consume, they are almost always at a premium. SMO uses NetApp FlexClone technology to create clones of production data. These clones only consume disk space as changes occur. SMO also supports the execution of scripts both before and after cloning. This facilitates data masking to hide sensitive customer data. Granular recovery. SMO allows you to restore data specifying the level of granularity, from a full database to a subset of tablespaces or data files. Flexible log backup policies. SMO lets you back up archive logs separately from data files by specifying different backup retention and protection policies. Integration with BR*Tools. SnapManager for SAP has been fully certified with SAP BR*Tools. For instance, it automatically coordinates with the SAP BR*BACKUP tool to identify the backup dataset and put the appropriate database in hot backup mode. Full SnapVault integration. SnapManager for SAP provides full integration with NetApp SnapVault, providing fast, space-efficient disk-to-disk backup to a local or remote location. Cloning for dev/test. The ability to provide numerous copies of production datasets is critical in application development and test environments. Because of the space that copies consume, they are almost always at a premium. SMSAP uses NetApp FlexClone technology to create clones of production data. These clones only consume disk space as changes occur. SMSAP also supports the execution of scripts both before and after cloning. This facilitates data masking to hide sensitive customer data. Flexible log backup policies. SMSAP lets you back up archive logs separately from data files by specifying different backup retention and protection policies. SnapManager for Hyper-V provides backup, restore, and disaster recovery for virtual machines running on Hyper-V servers. Support for VHDx. VHDx is the new Windows Server® 2012 Hyper-V virtual hard disk (VHD) format. SMHV lets you maintain proper alignment and configuration of dynamic VHDs so you benefit from their storage efficiency while achieving the performance typically available only with static VHDs. Application-aware backup. Since SMHV uses VSS integration, the backups it creates are application aware. Because VSS is invoked before Snapshot copies are created, Microsoft applications running within Hyper-V VMs are backed up in a consistent state when the VM is backed up. Crash-consistent backup support. In some circumstances, it is preferable to back up Hyper-V environments without invoking VSS. SMHV supports this option, providing crash-consistent backups in which neither VMs nor applications running in them are guaranteed to be consistent. Customized workflows. SMHV includes Windows PowerShell 2.0 cmdlets, the OnCommand® plug-in for rapid provisioning cmdlets, and the System Center Orchestration Integration Pack, all of which simplify the creation of custom workflows. SnapManager for Virtual Infrastructure is the SnapManager solution for protecting VMware virtual machines. SMVI provides a standalone interface and is also part of the NetApp Virtual Storage Console (VSC), which is a plug-in for VMware vCenter™. Granular restore. Restore full datastores, VMs, VMDKs, and guest OS files. Single file recovery. This capability lets you restore one or more files from a VMDK without restoring the entire VM. A restore agent (RA) is installed on a guest VM to allow you to browse "disks" containing files to be restored. The RA enables the guest OS to scan for new storage and mount disks to the active file system. The requestor can see a list of backups, mount a disk from the backup, and copy the desired files. SnapManager software can be installed on physical servers and within virtual machines. Specific software must be installed and/or licensed on both the server and storage. On the server side you should install the NetApp DSM (Device Specific Module) if the server is running Windows. The DSM plugs into the Microsoft multipath I/O framework and increases the ability to recognize and interoperate with SAN-attached LUNs. The NetApp DSM gives NetApp significantly greater management of the multipath I/O subsystem. Next, install the appropriate version of SnapDrive and the desired version of SnapManager software. If you're installing on a Windows cluster, this must be done on each node of the cluster. The specific licenses you need depend on the capabilities of the SnapManager product or products you want to install. Because SnapManager software is installed on the server and interfaces with NetApp storage primarily through NetApp SnapDrive using defined API calls, it happily coexists with other NetApp software running on the storage system itself. As you can see, SnapManager actually makes direct use of many other NetApp software features. SnapManager software is able to work with both 7-Mode and clustered Data ONTAP configurations with no changes. In clustered Data ONTAP configurations, SnapDrive connects to Vservers rather than physical storage systems. Vservers can move to different locations within the cluster without disrupting SnapManager operations. NetApp SnapManager software is a suite of data protection tools that provides an industry-leading level of data protection for enterprise applications—including Exchange, SQL Server, SharePoint, Oracle, and SAP—as well as VMware and Hyper-V virtual machines. To learn more about NetApp SnapManager, including details on specific versions, refer to the SnapManager Product Page. Santhosh has over eight years of experience in the high-tech industry. He has been with NetApp for two years, serving as the technical marketing engineer for Microsoft-related products such as SnapManager for Hyper-V, SnapDrive for Windows, and SMI-S (Storage Management Initiative-Specification). Santhosh works closely with NetApp customers to understand their needs, and he collaborates with product marketing and engineering teams to formulate roadmaps that address customer priorities. Santhosh and the rest of the NetApp Microsoft team contribute to the blog NetApp for Microsoft Environments. Be sure to also check out the NetApp for Microsoft Environments blog, where all things Microsoft are discussed. The SAP OS DB MIGRATION ONLINE TRAINING is mandatory if you are going to migrate a productive system. The service delivery then includes all the systems in that system landscape. If you want full support for the migration (be it a production system or not) then you must secure the services of a technical consultant with special certification for OS/DB migration. http://saptrainings.com/sap-osdb-migration-online-training/The services include guidance during migration planning, hotline support for the SAP tools, and an SAP operating system or database migration check. If the prerequisites are not met, we must inform you that SAP cannot provide any SAP Support Line support for your migration. All support during the migration, when solving inconsistencies and performance problems, and if data loss occurs, can be provided by SAP OS DB MIGRATION ONLINE TRAINING only as a consulting service that is subject to charge.